I confess that I was pleasantly surprised by this book. 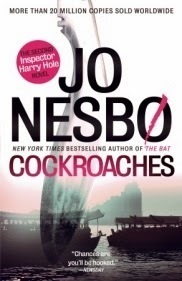 It’s the second in Jo Nesbo’s series featuring Norwegian homicide detective Harry Hole, and as those who follow the series know, for whatever reason, Nesbo’s publishers did not release the books in order here in the U.S. Rather, they jumped into the middle of the series first. I assumed that this was because they felt that the first couple of books were not as good as the latter ones and so wanted to put Nesbo’s (and Harry’s) best foot forward first. The first book in the series, The Bat, was finally released here last year and seemed to confirm the suspicion. It’s a solid effort, and not bad for a first book, but it’s not up to the standards of the later ones. I expected the same from Cockroaches, which was finally released here last month, but as I suggested above, I was surprised by how much I liked it. The book opens when Norway’s ambassador to Thailand is found stabbed to death in a sleazy motel in Bangkok, while apparently awaiting the arrival of a young prostitute. This is not the sort of thing that reflects favorably on an ambassador or on the government that posted him to Thailand. The Powers That Be in the Norwegian government are much more concerned about avoiding a scandal than they are in finding the guilty party, but they have to put up a good front. To accomplish these ends, the government assigns Detective Harry Hole to go to Bangkok and assist the locals in the investigation. Hole has just gained some notoriety for solving a difficult case involving the death of a Norwegian citizen in Australia and thus to all outward appearances, seems an ideal choice. At the moment, however, Harry can most often be found in an alcoholic daze and not at his detecting best. The expectation is that Harry will go to Thailand for a few days, drink himself into a stupor, and allow the locals to sweep the whole embarrassing incident under the rug. Of course, as everyone who’s ever read a crime novel understands, that’s not about to happen. Our intrepid hero will instead sober up and pursue the case to the ends of the earth, or at least to the ends of Thailand, no matter where the chips may fall. And in the process, of course, he will exasperate the hell out of his superiors. The ambassador’s death turns out to be a murky and complex case, involving a large cast of intriguing and well-drawn characters. Hole is a great protagonist, and there are a lot of unexpected twists and turns. There are also a lot of interesting insights into the people, culture and geography of Thailand. The story moves along at a good clip, and all in all, it was a very entertaining read. As I suggested in my review of The Bat, it does seem a little odd that a series involving a Norwegian detective would begin with two books set in foreign countries, but in the end, I enjoyed them both and am relieved that I can finally read all of the books in this series in order. I’m going to enjoy Harry’s journey.